EIA/TIA compliant 19” solid, one-piece 16-gauge steel rackshelf shall be Middle Atlantic Products model # U1 (1=# of rackspaces). Weight capacity shall be 35 lbs. 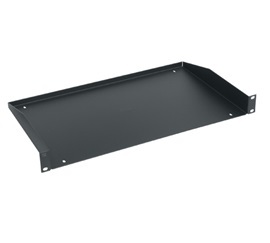 Rackshelf shall feature durable flat black powder coat finish. Contractor packs shall be available with twelve U1 or six U2 rackshelves and shall be model # U1-RP12 or U2-RP6. U series rackshelf shall be UL Listed in the US and Canada. U Series shall be GREENGUARD Indoor Air Quality Certified for Children and Schools. U Series shall be RoHS EU Directive 2002/95/EC compliant. U series shall be manufactured by an ISO 9001 and ISO 14001 registered company. U series rackshelf shall be warrantied to be free from defects in material or workmanship under normal use and conditions for the lifetime of the product.